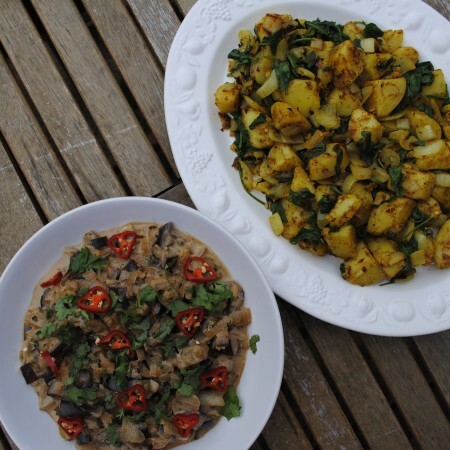 A simple, yet very tasty vegan curry dish based on the Punjabi recipe Baingan Bharta. This creamy Aubergine Curry goes great with a Sag Aloo. If you are feeling the cold at the moment, then it is time to add some heat to your meals too warm you up a bit. Dishes filled with exotic spices can at least make you feel like you are in a warmer country, even if you are peering out of your window at a wet and grey day. I was a vegetarian for nearly 10 years and although I never really missed the taste of meat, I did miss the texture, which is why I ate a lot of aubergine. Of course it doesn’t have the exact texture of meat, but it is the closest you will come to it whilst eating vegetables and an added bonus is that aubergine absorb the flavours of the herbs and spices really well, making it the perfect ingredient for a curry. Chances are, if you are ordering a curry or sitting down to a meal at an Indian restaurant, then you have chosen a meat based dish (unless you are vegetarian of course). Try making a veggie friendly curry, as many traditional Indian dishes are vegetarian, because many Indians are vegetarian. You will not miss the taste of meat, because of all the other wonderful flavours that are going on. 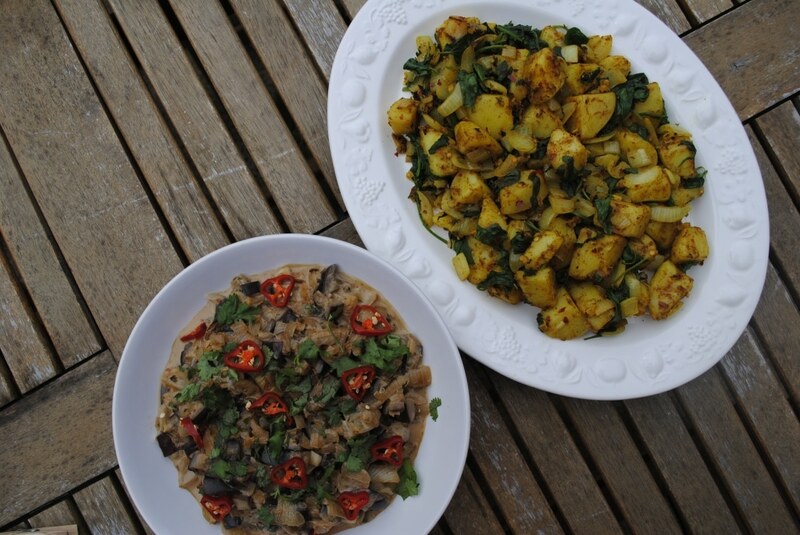 You can make it as hot or as mild as you like, which is why I really like using coconut milk in curry, as it cools it down for those that don’t like the heat, but for those that do, they can add an extra kick of chilli one it is all served up. Sstart by making the paste for the curry. Add the garlic, ginger, chilli, lemongrass, lime and coriander to a pestle and mortar and crush into a paste. 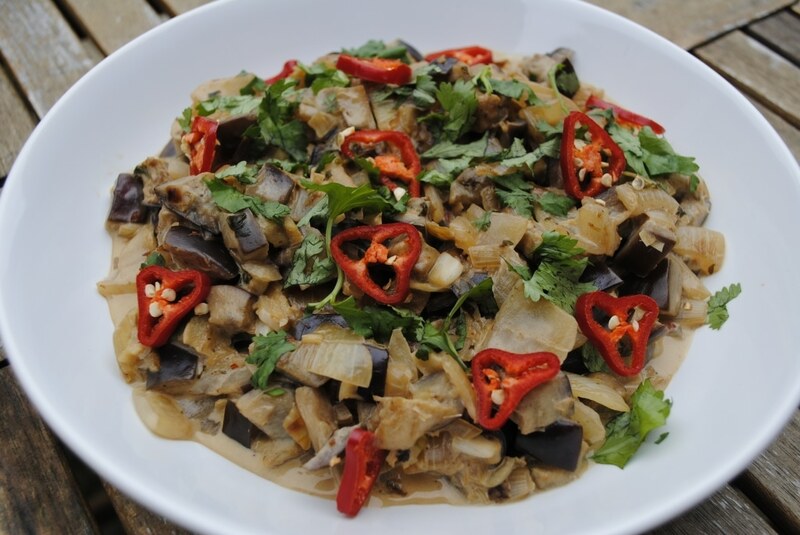 Cut the aubergine into cubes and add to a hot pan with some oil and cook for 5 minutes. Remove the aubergine from the pan, add the onions and cook for 3 minutes until browned. Put the aubergine back in the pan with the onions and add the curry paste and cook for 2 minutes. Add the coconut milk and simmer for 10 minutes. Cut the potatoes into cubes and par boil for 5 minutes and then drain. Heat some oil in a pan and cook the onion, garlic and ginger for 2 minutes. Add the potatoes, garam masala, turmeric and coriander and cook for a further 3 minutes. Add the spinach and cook for a further minute. What is your favourite curry? Leave a comment below and it could inspire the next HHH recipe. This items are most popular in Indian Restaurant in London. Tofu cooked with creamy tomato base sauce and fenugreek. Served with basmati rice, vegetable curry, soup and spring roll.